Your quacky friends will eat to their bellies' content regardless of what you give, so give what's best: pelleted mash with veggies on the side. 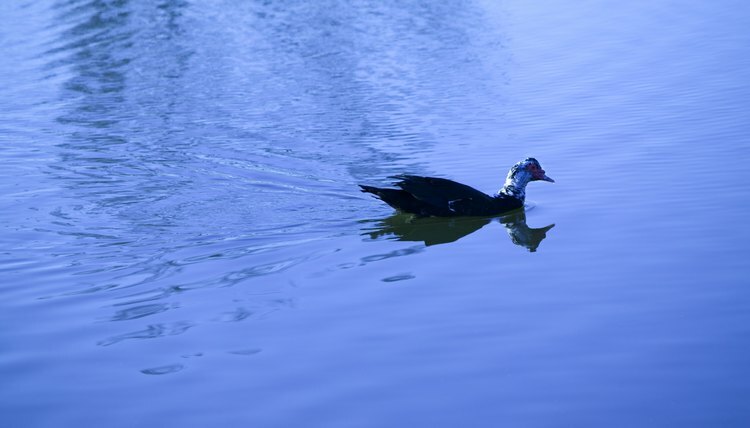 Ducks can sparingly eat many grocery foods. For instance, when you're making your morning eggs, the ducks would appreciate some. Just don't tell them what they are. Ducks need protein to grow and thrive, but ducks in captivity do well on a mostly vegetarian diet. Their protein is derived mostly from high quality pelleted feed that is formulated for ducks. It can be found in commercial feed stores. It must be stored in airtight containers and away from the elements, as ducks are sensitive to mold. Hard-boiled eggs are a good source of protein for ducks. They'll eat worms, too; as they wander around their captive homes, they might find worms and slugs for protein; you can purchase the same and feed them by hand. The proper amount of protein ducks require varies from one stage of life to another. Ducklings require 20 percent to 22 percent of their diet to be protein as they grow. Adolescents need a diet of 16 percent protein; adult ducks need 16 percent to 18 percent. Ducks will munch away to their hearts' content on lettuce. It is best if the lettuce has been chopped to a fine consistency so they won't have trouble eating it. An array of vegetables will provide vitamins and minerals that the ducks need to stay healthy. Tomatoes are also a suitable addition to their daily salad. Worms, including bloodworms, earthworms and mealworms, and insects are tasty treats for ducks. They will scavenge around looking for these creatures themselves, but they'll welcome a hand-fed offering. Snails and slugs also make the list of things ducks love to eat. The website Live Ducks points out the importance of making sure that the bugs, snails and slugs you give to ducks aren't treated with any trace of poison or pesticide. Many edibles are not suitable for ducks. Contrary to popular practice, bread is a big no-no for ducks, whose digestive systems are not equipped to digest bread, crackers, cookies, chips and other similar foods. Ducks cannot eat seeds, nuts, garlic, spices, chocolate or anything that contains artificial dyes or preservatives. Their diet needs to stay as natural as possible. Unfortunately, ducks are similar to most humans when it comes to eating right. They happily accept foods they shouldn't be eating and put off eating the healthy foods their bodies need.